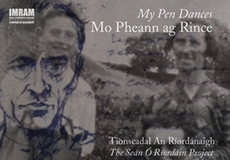 Seán Ó Ríordáin (1916-77) was a pioneering presence in twentieth century Irish language poetry. His work continues to engage today’s Irish readers and writers with its honesty, humanity, humour, wordplay and striking juxtapositions of images. This IMRAM show celebrates the recent publication of his diaries, Anamlón Bliana (edited by Tadhg Ó Dushláine) and Selected Poems (edited by Frank Sewell). Ailbhe Ní Ghearbhuigh will read Ó Ríordáin’s poems to musical accompaniment from guitarist Enda Reilly, whilst Liam Ó Muirthile will read selections from the diaries. The show features on-screen projections with images created by Margaret Lonergan. Bhí Seán Ó Ríordáin (1916-77) ina cheannródaí filíochta in Éirinn a linne. Léitear fós le fonn is le fiosracht é. Mealltar sinn ag a mhacántacht, a dhaonnacht, a ghreann, an t-imeartas focal agus na comhfhocail sin ina scilling-smaointe is iad ag clingeadh i gcúl aigne an léitheora. Déanann an léiriú seo de chuid IMRAM comóradh ar fhoilsiú na ndialann ar na mallaibh, Anamlón Bliana (in eagar ag Tadhg Ó Dúshlaine) agus Selected Poems (in eagar ag Frank Sewell). Léifidh Ailbhe Ní Ghearbhuigh cuid de dhánta an Ríordánaigh le tionlacan giotáir ó Enda Reilly, agus léifidh Liam Ó Muirthile sleachta as na dialanna. Íomhánna breátha ar scáileán le Margaret Lonergan. Ailbhe Ní Ghearbhuigh was born in Kerry. She has read at festivals in New York, Paris, Montréal, Berlin and Ballyferriter. In 2012 her poem ‘Deireadh na Feide’ won the O’Neill Poetry Prize. ‘Filleadh ar an gCathair’ was chosen as Ireland’s EU Presidency poem in 2013 and was shortlisted in 2015 for RTE’s ‘A Poem for Ireland’. Her first collection, Péacadh, was published in 2008. Tost agus Allagar (2016) is the title of her new book. Enda Reilly is a singer, guitarist and songwriter from Dublin whose projects include New Songs In Irish Amhráin Nua i nGaeilge and Climate Change Songs Workshops, Arise and Go!, a collaboration with poet Stephen James Smith. He has also written music as part of a poetic play, Everlasting Voices which has taken him to India and Japan and worked with many Irish language poets through IMRAM. He has been facilitating his Climate Change Songs Workshops in schools and libraries for the last 6 years in the greater Dublin area. These are based on his songs about Climate Change and his love of science which he has never lost since getting his degree in Geology from UCD. Enda is a former winner of the Christie Hennessy Song Competition, Comórtas Amhráin Rónán Beo @3 (on RnG) and has represented Ireland with songs in minority language song competitions. He has played concerts with John Spillane, Kila, Liam O Maonlai, Rónán O Snodaigh and John Prine amongst others and sang with The RTE concert Orchestra on Culture Night last year. He has recently released his latest album, Whorls, a selection of WB Yeats’s poetry set to music and is delighted to have co-written 6 songs with Aoife Scott for her debut album Carry The Day. Liam Ó Muirthile was born in Cork city in 1950, the first of nine children. He has spent time in the Corca Dhuibhne Gaeltacht since he was in secondary school. Liam then went to UCC on a City Corporation scholarship. He spent a year in France during this time and went on to get a BA in French and Irish. Seán Ó Ríordáin and Seán Ó Riada were very influential in UCC at this time and Seán Ó Tuama was Professor of Irish. Michael Davitt, Nuala Ní Dhomhaill and Gabriel Rosenstock were contemporary students of Irish and they launched the acclaimed poetry publication Innti. His first collection of poetry, Tine Chnámh (1984) won the Ó Riordáin Prize at the Oireachtas. He was presented with the Irish-American Cultural Foundation Prize (1984), the Butler Award (1996), the Arts Council Prize (2001) and Gradam Chló Iar-Chonnacht (2000) for his poetry collection Walking Time and Other Poems. His novel Ar Bhruach na Laoi won the major fiction award in the Oireachtas (1995). Sceon na Mara (Cois Life, 2010), is a detective novel set on the east coast of Ireland. A recent prose work, a literary novel set in Paris, An Colm Bán (Cois Life, 2014), won a 2013 Oireachtas prize. An Fuíoll Feá – Rogha Dánta / Wood Cuttings – New and Selected Poems, a bilingual poetry collection, was published by Cois Life in February of 2013. His most recent novel, Aois Fir, was published in September 2015. Department Head, Visual Communication) graduated from NCAD with a BDes in Visual Communication in 1989. In 1998, she completed an MA in Design, specialising in illustration and book design. Since 1989 she has maintained a freelance design consultancy and illustration practice. Her work has been published regularly in the national press (most frequently in The Irish Times), and she shared in a Society of Newspaper Design Award for Excellence for illustration work with The Sunday Tribune. She worked as designer-in-residence with Wet Paint Arts for four years, during which time she collaborated with other art form practitioners to design and deliver a range of community and context-based workshops in visual communication. Margaret worked as a lecturer in graphic design in the Faculty of Education, NCAD from 1991 to 2003, where she also taught workshops in digital image making to HDipADEd students and to BA Degree students specialising in other disciplines, as well as supervising students at MA level. She is currently undertaking research into practice-based postgraduate study in design, funded under the HEA Teaching and Learning Initiatives. 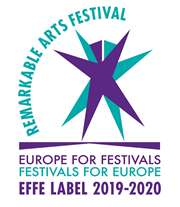 Other areas of interest include: the development of collaborative design processes and design-led projects; and the relationship between the application of digital media and typography in visual communication and in the fine art disciplines. Her design work for theatre companies is listed on the Irish Playography web archive. You can listen to Ian’s reading here and the videos are here. Former homelessness worker Ian Duhig’s seventh book The Blind Roadmaker (Picador, 2016) is a PBS Spring Recommendation and was shortlisted for the 2016 Roehampton Prize, the Forward Best Collection Prize and the TS Eliot Prize. A Cholmondelely Award recipient and Fellow of the Royal Society of Literature, Duhig has been joint winner of a Shirley Jackson Award, winner of the Forward Best Poem Prize & twice winner of the National Poetry Competition. You can listen to Amy’s reading here. Amy Barry writes poems and short stories. She is inspired by simply everything. She explores current issues, love, family, nature, death, famous people and places of interest. She also writes poems on table tennis, being the first poet to have her work published on the Table Tennis Ireland web site ( at www.tabletennisireland.ie). When not writing or gathering inspiration, Amy loves to travel. Trips to India, Nepal, China, Japan, Bali, Paris, Berlin, Budapest and Falkenberg have all infused her work. She is published in anthologies, journals, and press and e-zines, in Ireland and abroad including: Southword Journal, Misty Mountain Review, First Cut, Galway Review, Poetry 24, Mad Swirl, A New Ulster and Knot Magazine. Amy and her work have featured on radio and television in Australia, Canada, Italy and Ireland. Her work has been translated into Italian and Greek. For her contribution to Poetry Amy Barry was awarded a recognition certificate from the University Aldo Moro in Bari (Italy) by its Rector, Antonio Felice Unrcchio. Amy regularly organises poetry events in her hometown, Athlone. These include an eclectic gathering of local and international poets. She is often invited to read at festivals and literary events both in Ireland and abroad. You can listen to Ben’s reading here. Writer and musician, Ben Simmons was born in Belfast in 1988 and grew up in north-west Donegal. His poetry has appeared in Stand, Templar’s poetry magazine Iota, and included in several publications by Beautiful Dragons Collaborations, and Salmon Poetry’s Dogs Singing: A Tribute Anthology. In 2016 Ben was also included in Poetry Ireland’s Introduction series. You can listen to Mike’s performance here. Mike Garry was a librarian for 15 years before becoming a poet. His groundbreaking work with Manchester Libraries began with the development of Study Support Units or “Homework Centers” throughout Manchester’s local library network. The units were simply a safe space for young people to get help and support with homework with a strong emphasis on reading. But they were much more than that and quickly became hubs for creativity, support, literacy and learning. Mike’s three books – Men’s Morning, Mancunian Meander and God is a Manc have become schemes of work in hundreds of British schools, received wide critical acclaim and are regularly read on TV and Radio. Mike is Associate Fellow and Artist in Residence at the University of Westminster in London and was Awarded an Honorary Doctorate from Manchester Metropolitan University for his is work. He is also currently working on a Libretto about Alan Turing with Philip Glass that will be premiered at the 2016 Days and Nights Festival in California. You can listen to Ann’s performance here. Ann Leahy‘s first collection, The Woman who Lived her Life Backwards (Arlen House, 2008), won the Patrick Kavanagh Award. Individual poems have also won national awards and have been twice commended in the British National Poetry Competition. Her poems have been published widely in journals (such as AGENDA, Orbis, Poetry Ireland Review, Stand and others) and anthologies (such as Best of Irish Poetry 2010; The Echoing Years: An Anthology of Poetry from Canada and Ireland, 2007, and others). One of her poems has been put to music in a choral piece composed by Michael Gallen (Pursuing Moths). She has taken part in writers’ festivals in Ireland and abroad and received a Culture Ireland bursary for a reading tour in the U.S. She grew up in Co. Tipperary and lives in Dublin. Michael Coady lives in the town of his birth, Carrick-on-Suir, Co. Tipperary and was elected in 1998 to Aosdána, the affiliation of artists under the aegis of the Arts Council of Ireland. His Oven Lane and Other Poems was recently republished in a new edition by Gallery Press. It joins Coady’s unique All Souls, One Another and Going By Water, each book of the trilogy integrating and orchestrating his poetry, prose and photography. A self-styled “lapsed trombone player”, he has also been involved in music of various kinds and published a personal memoir of the Clare traditional musicians Pakie and Micho Russell, and an illustrated miscellany of short prose work, Full Tide (Relay Books, 1999). Coady’s published and broadcast work includes critically-admired memoir of family migration and displacement in America. He has been awarded the Patrick Kavanagh and the O’Shaughnessy prizes for poetry. In Spring 2005 he held the Heimbold Chair in Irish Studies at Villanova University, Pennsylvania and in 2008 a writing residency at the Centre Culturel Irlandais in Paris.